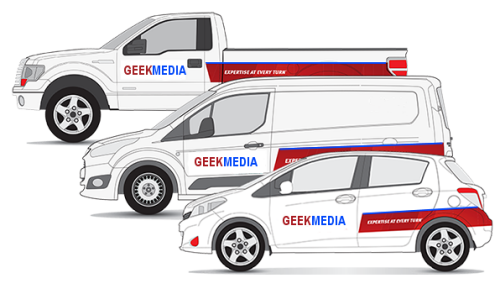 If you are an Ad agency, media buyer or advertiser, interested in advertising your products and services, The Computer Geek Multi Media Truck Advertising Service can help you. We offer truck side advertising, on all white delivery trucks in the Toronto and GTA area(s). Utilizing advertising trucks for your truck side advertising campaign will help your brand grow. If you are a fleet owner of one or hundreds of trucks or trailers and need to advertise your business or your customer's business, utilize The Computer Geek Multi Media Truck Advertising Service patented vinyl banner frame kit system. Own the most technologically advanced vinyl fleet graphics frame system take advantage of all the benefits our system offers, including NO DAMAGE TO TRUCK SIDES and its super light weight, resulting in the lowest cost of ownership in the industry. The Computer Geek Multi Media Truck Advertising Service offers effective and affordable truck media advertising campaigns on our network of ad trucks. Media space is available on our local delivery trucks that travel within the Greater GTA Area. For more information and advertising rates call us today. gta multi media advertising | Computer Geek 5 out of 5 based on 103 user ratings. The Computer Geek GTA Multi Media Advertising. Offering affordable multi media advertising in the GTA Area.